Since Drew now is a Divemaster in the Dive Immersion Program at the Georgia Aquarium — a job, by the way, which seems to beat out voiceover talent for the coolness factor in the minds of other people — he no longer needs a home office. We are converting his office to a man cave, and we need some additional storage space. We decided we could accomplish our storage needs by adding one more cabinet to our garage. 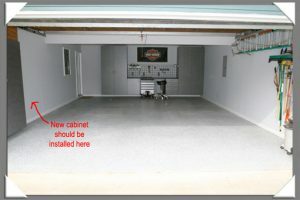 A few years ago, in our ongoing quest for beautiful organization, we hired Premier Garage to renovate our garage. As repeat clients, we thought it would be a quick, easy, and painless process for them to install the new cabinet, especially since the company has an office and manufacturing facility about 2 miles from our house. in a beautifully organized garage of a repeat client? To date, Premier Garage has been to my house an astonishing 4 times over multiple days, with a 5th trip scheduled next week, for this cabinet installation! Yes, the job should be simple, but this company is too disorganized to plan and execute it. 1) The tech arrived with the wrong size of cabinet and no door handles. What happened to the adage of “measure twice, cut once”? 2) The tech came back another day with a replacement cabinet, which was STILL the wrong size. I wondered why they didn’t bother to check it before they left the office. 3) On the third attempt, the tech came with the right size of the cabinet shell, but the doors were the wrong size. He also didn’t have the interior shelves. 4) This morning, the guy was were here to install the correct doors. Again, we have no handles and no shelves! In addition, the cabinet has holes in the back wall caused by incorrect drilling that must now be filled. “Measure twice, cut once” is definitely a foreign concept to these folks. On 3 of the 4 visits, we were given an arrival window of a 30-minute time period, yet the techs still showed up late without even a courtesy call. Today, the tech backed into the driveway up to the garage threshold and left his truck running while he worked, which filled my garage with the lovely smells of gas fumes and truck exhaust on a day that promises to be quite hot. The easiest and most gratifying voiceover job for me is one with a repeat client. I look at the last session for that client and copy the same Pro Tools settings to the new session. I know the type of file transmission that the client prefers. I communicate about the turn-around time at the project outset and then work to beat the deadline. The client has no concerns about the quality of my recordings or my speed and efficiency in completing the job for them because I proved myself to them the first time and pride myself on maintaining a consistent high level of service. In short, a job with a repeat client is an opportunity to exhibit consistency and reliability. If you are reliable and consistent, a client will turn to you automatically when they need voice talent. What’s more, they are happy to refer you to other people who could utilize your services. You can count on me. You can believe in me. If I say I’ll do something, I’ll do it. Put it in the bank. Bet the farm on it. It doesn’t matter whether or not I’m in a good mood, have a headache, forgot to pick up my clothes from the cleaners, had a fight with my daughter, lost my keys, or didn’t sleep last night. If I said I’ll do it, then I’ll do it. What’s more, I’ll do it every time. We love people who do what they say they will do. Consistency is the foundation of success and the great business builder. Consistency is the definition of integrity. I told the tech on-site today that Premier Garage is not making it easy for us to want to refer them due to their inconsistent, unreliable, and sloppy approach on this job. Hopefully, you can learn from their many mistakes and make it easy for your clients to want to refer you! If you have other tips about gaining referrals, please leave a comment on the blog! Very well said, and always timely advice. Living in Atlanta I now know who not to call when I need garage improvements done; someday, when I once again have a garage. What would you charge me to store my two Harleys in yours? 1) He explained that he was the company owner when we had the original work done in our garage. That job went like clockwork and was a delight in every respect. 2) He told me the cabinet color had been discontinued, but he had accepted this repeat job because he wanted to do everything possible to keep his customers happy. 3) He explained that his company is operating leanly in these economic times. He said 95% of their jobs are done to perfection as was the case with our original renovation. However, operating with minimal staffing doesn’t allow much leeway for adjustments when things go wrong as they did on this job. 5) Although I didn’t ask for compensation, he insisted on refunding the entire cost of the cabinet installation! He said this job is not an indication of how he wants to run his company, and he values us as clients. When we talk about the company to other people, he wants us to be able to say positive things about them. I truly appreciate his candor and his can-do approach to solving my problem — something that voiceover talent and all service providers should emulate.